Shrimp Remoulade (pronounced ruma-lahd) is a wonderful first coarse cold appetizer. Any good Remoulade sauce has a full flavored zip that really gets your taste buds jumping for the following courses. As far as the best Shrimp Remoulade in New Orleans, I’ll leave that up to you and the comments section, as always, your comments welcomed and appreciated! One Remoulade Sauce that I had in the city was at Arnaud’s, which is famous for it’s Remoulade variation, called Shrimp Arnaud. Personally, I think their sauce is too heavy on the horseradish, and I’m a guy that likes his horseradish. I prefer a balance of flavors, and all I took away from the Arnaud’s Sauce was nostril flare, but that’s just me. There are two types of Remoulade sauces in Louisiana, and probably a million recipes for each. One is a white, mayonnaise and mustard based style, similar to the traditional French used for the Bistro classic Celeriac Remoulade. The emulsion should be fairly thick. Adjust the seasonings and refrigerate overnight. Turn off the heat. Wait 2 minutes (make sure the Shrimp are white all the way through), then remove them to the ice bath. When they’re completely cooled, remove the shell, keeping the tail intact, then devein. Coat the shrimp in a small amount of the sauce and marinate for about 15-20 minutes. To serve the Shrimp Remoulade, cover the base of 2 chilled appetizer or salad plates with shredded lettuce. Tastefully arrange the shrimp on top of the lettuce, 6 per plate, and garnish with green onions, thinly sliced on the bias. I really like the idea of the red remoulade sauce, will definately give it a go for Xmas. Just a query – how does it emulsify without an egg yolk? Will it separate if kept? You will love it, excellent for a Christmas appetizer. It will stay together just fine, although there may be a very minor separation, just give it a quick whisk before serving. We love to eat at Drago’s and we are making the charbroiled oysters for our New Year’s dinner. My husband is from NOLA and loves to cook (as a good CAJUN should). Thanks for sharing this website and recipe with us…. Outstanding sauce. I used it recently on some fried green tomatoes Ugly’s style (man do I miss that place). I love to broil my shrimp instead of boil them. Brine them for 30 minutes, dry them off, toss them in oil with seasoning, and broil for a minute or two on each side. Thanks, this is my new go to remoulade. FYI: Arnaud’s remoulade sauce DOES NOT contain horseradish – not even a hair. Many people believe that kick it has is horseradish, but as a former employee and local i can say it isn’t for a fact. However, i will not tell u what the “secret ing” is. Ditto @6 CopCop. I’m not sure how “secret” this ingredient is meant to be. When we last ate at Remoulade’s, I asked our waiter about horseradish kick in the sauce. He didn’t know what was in it, but went to ask in the kitchen, and came back quite forthcoming about their creole mustard. What wine would you accompany this with? ChefJ – I would serve a nice French White Burgundy. Question: Why would you leave the tails on? The shrimp are awash in sauce, so that means you have to maneuver a knife and fork to cut the tails off, leaving quite a bit of meat in the shell. This happens in the best of restaurants. I don’ think there is anything attractive about shrimp tails. 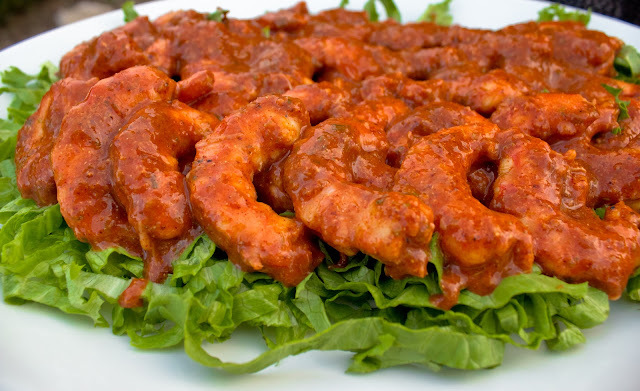 Space Cadet – I think of the Shrimp tail shells as little handles, that actually aren’t awash with sauce, like in the picture. I hold them by the tails and dip them in the sauce before plating. Same thing for eating but you give them a pleasant little pinch near the bottom of the tail and the meat comes right out, you don’t lose anything. I can go either way though, sometimes I leave the tails on sometimes not, it depends on who your feeding or the type of occasion. If you’re doing stand up appetizers the tails work great. A sit down meal, off with their tails! By the way, you know why most restaurants leave the Shrimp tails on right? It makes the plate look more bountiful. WOW, Look at all that shrimp!! What a great Value! Ah, thanks for the memories about A&G, Jon. You can always tell a great food culture, not so much by how great the food is at an expensive restaurant, but by how good the food is in the run of the mill places. Along those lines, I always like DH Holmes cafeteria in downtown New Orleans–great shrimp remoulade too. BTW–Holmes used to sell its own remoulade sauce–anyone have a recipe? Ok… I admit that I am a newbie that has absolutely fallen in love with NOLA over the last few years, from the food to the festivals ot the people to the places..
I’ve begun trying my hand at several recipes, but i have no idea what Creole mustard is! Is it something you make or buy? Any help would be appreciated! I’d like to try this recipe but not sure where to start to find that ingredient! Creole mustard is dark mustard with seeds in it. Locally, it’s made by Zatarain’s. I think Crystal also makes Creole Mustard. I’d forgotten the A&G Cafeteria in Northgate Mall, Lafayette. Great Shrimp Remolaude, I agree.